1. What good shall I do this day? 2. What good have I done today? Would they be useful questions to ask ourselves every day? When planning each day, he considered "Prosecute the present study" which means to invest time for education, study or some form of self-improvement. If such a great man as Benjamin Franklin included this on his daily schedule, do you think it would benefit each of us? 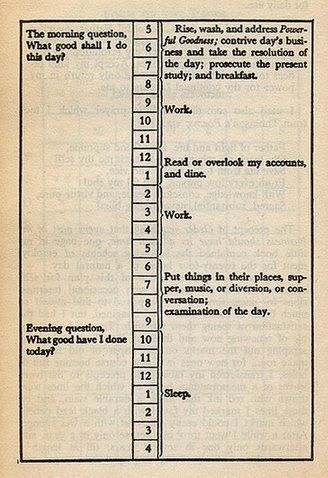 I have never seen Benjamin Franklin's schedule before, but this is so great! My father-in-law is always saying, "a third each to work, play, and sleep."